Getting children to enjoy school can also be a challenge for some parents. There are many reasons why some children are not eager for school. 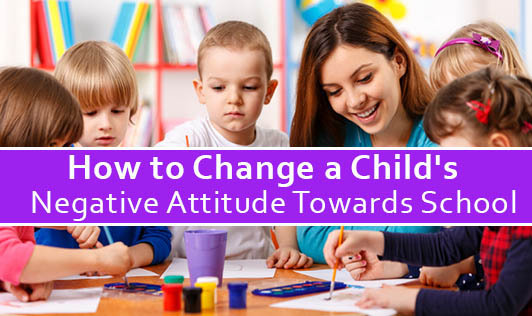 It is imperative that their parents or caregivers take the time to understand the causes of the negative attitude. Only then will they be able to work with the child to succeed both socially and academically in school. Read on to learn how to change a child's negative attitude toward school. 1. Find a time that you are not distracted to sit down with your child and talk about his day at school. Ask open-ended questions and allow him to do most of the talking. 2. Listen attentively without judging. What she has to share sometimes might be trivial to you, but it may be very important to her. If something bothers her, it is important. Read between the lines. 3. Allow him to express himself and avoid dictating to him what he should do. 4. Probe to discover the things that bother her at school. It could be a teacher, homework, friends, the feeling of not fitting in or some other fear. 5. Allow the child to resolve her own concerns first before jumping in to help her solve every dilemma. 6. Give him a couple of days to work out a plan that he thinks can help overcome his issues and work together with him after that. 7. Express your confidence and love. Tell your child that you are there to listen and help. Explain that talking out problems can sometimes help her to see a clearer picture and how she can overcome her frustrations. 8. Talk to a counselor or teacher at school. They are there to help your child adjust to school and succeed. 9. Help your child to find a friend that has the same interests. Invite this friend over and get to know him. Your child will feel connected to a friend at school and will not feel so alone. 10. Express excitement about school. Share your school memories with your child and how you faced similar challenges and overcame them. It is good for her to know that parents faced the same thing and learned to deal with it. 11. Encourage him to pray for help and remember to express your love.